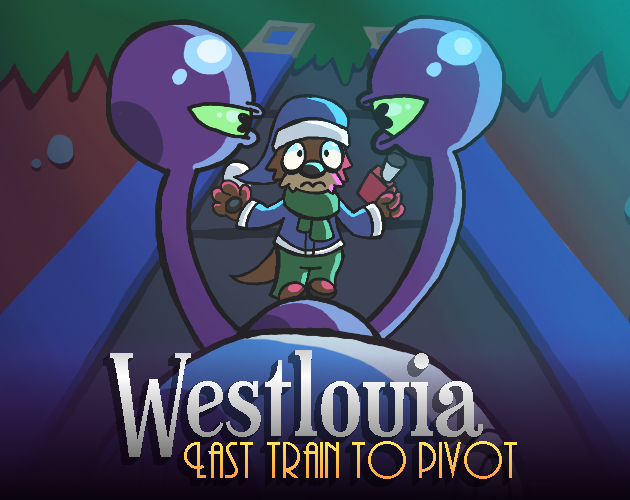 Westlouia is a platform game where you take control of an otter named Garret Rapids, who sets out to use his ice powers to save his friends from freaky monsters. The game mixes old and new mechanics and design sensibilities to (hopefully) create a game that feels unique, and not like a retro-rehash. 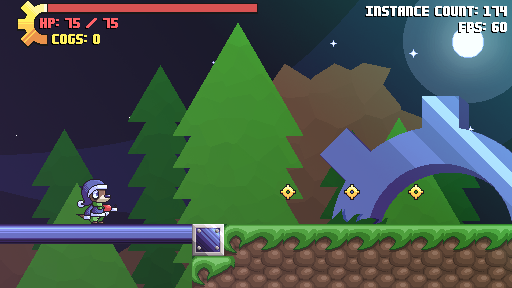 This game was originally intended as a sequel to Westlouia Pilot: Through the Timber. (Pilot as in, like, first episode.) Over time I realized I didn't much care for the framework Through the Timber laid down, so I figured it'd be best to start from scratch like a lot of things do after their "pilot episode." The story takes place in a region called "Westlouia," named as such for being a sort of "Wild West" where anything can happen. Apparently it was discovered by a guy named "Louie." I'd have to check the history books. I would have used a more mainstream-sounding name, but nothing else really stuck. Maybe I'll give it a cool subtitle. Something like "Secret of the Last Jedi's Awakening... Menace." Yeah. Jan 20, 2018 - I talk about some general features of the game in hazy detail. It's hard to do a first vlog. I'll try to give the rest of my vlogs more specific content. Our hero, Garret Rapids, about to set off on his first adventure! A hostile snail takes the otter lad by surprise! The game can indeed be paused! That's f u n n y . Quirky characters in a strange, yet oddly familiar, world! 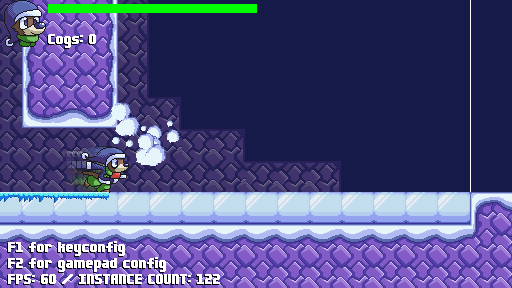 Use your ice gun to blast through mysterious monsters! 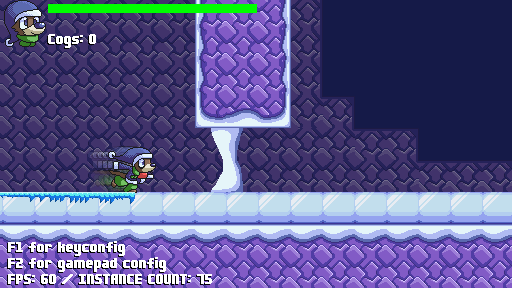 Dash through levels in style with your ice magic! 20 Jan. 2018 - Lately I've been working on a small demo for the game. This demo contains a short level and a boss fight. Hopefully this demo gives players a taste of what's to come. Feedback is appreciated. I need it. I'm desperate. ANYONE. PLEASE. Well, when the demo is out, anyway. That shouldn't be too long now. All that's left now is a bit of polishing up on it. Now, as for the rest of the game, this'll be interesting. Edit 20 Jan 2018: Fixed up formatting a bit. Then fixed it again. Then again. Then again. And again. I also changed the title in hopes that no one would notice. Edit 27 Jan 2018: Changed the title to reflect the actual title rather than the working title. Here's where I'd write a lengthy post about what I've changed, but I figured it'd be better to just let you try it out. The link is at the bottom of this reply. Garret can slide around on ice, a bit like a certain Pixar superhero. "HONEY, WHERE'S MY STOCKING CAP!?" 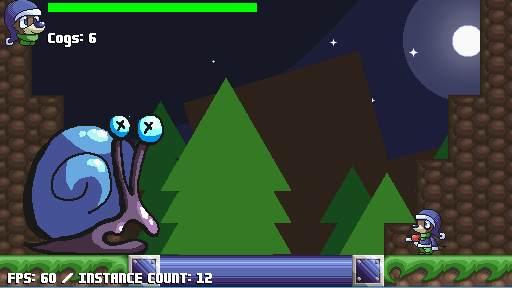 A Hostile snail takes the otter lad by a bit less surprise, but with updated visuals! 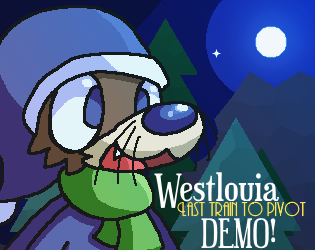 Click here to play the demo! I found a bug in the demo that needed to be ironed out. If you tried to adjust the keyboard/gamepad controls in the options menu on the title screen, the screens would fail to work properly. 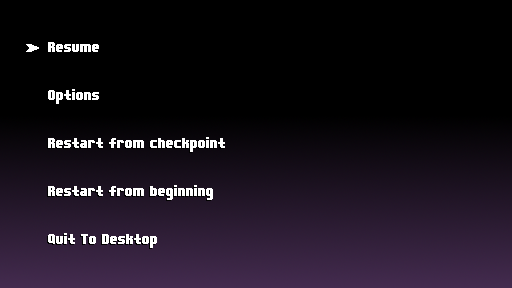 To fixed this I just... took out that particular options menu. Worry not, it still works in-game. 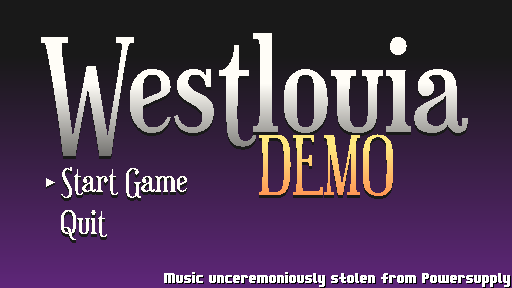 I also added a splash screen to hopefully help the game load content faster, since the music has a new way of being loaded to future-proof for platforms other than Windows. For some reason, it never occurred to me to release a trailer for the demo. That is, until now. A few things were tweaked this time around. They're all quality-of-life and stability features. 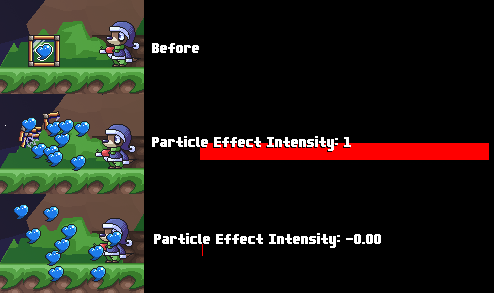 A slider has been added to the Settings menu on the Pause screen that lets you adjust the amount of "particle" objects on the screen at once. This can be used to make the game less laggy on low-end computers. Heck, sometimes it even would lag on mine. If you look closely at the official screenshots, one is taken during a minor lag spike. This checkpoint didn't work. At all. If you died after touching it, it would send you to the start of the level. The reason for this was because there was a door object that was overriding it. Whoops. Again. 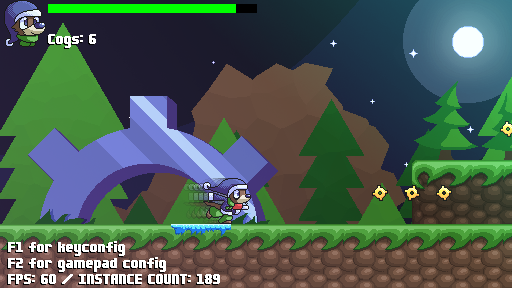 This may seem like a lot of updates for one demo, but I have a nasty habit of letting bugs and issues stack up in earlier builds and haunt me until completion, leading to massive periods of fixing things. I'm trying to stay on top, right now. 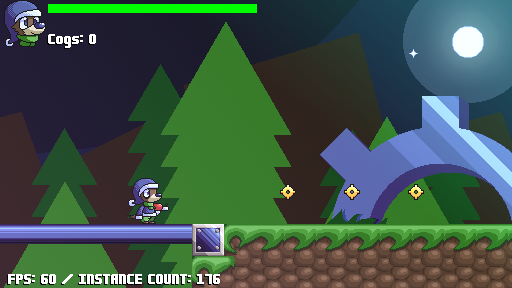 Now that the demo's out featuring the tutorial level, I'm working on some more levels to explore. My main focus right now is a level called the Arctic Fjord. The Arctic Fjord's design is all about skating on the ice. Unlike normal ground, you don't stop dashing when you're on ice. Don't worry, though, Garret can walk on the ice without any problems, unlike some other characters. And don't worry about that snow barrier there. Garret's got enough speed to smash right through it! Yep! There's a subtitle now. I figured "Last Train To Pivot" gave folks a bit more to latch onto with the title. I mean, what the hell's a "Westlouia?" Now, everyone knows what a Train is. I'll just have to assume they figure out that Pivot is a location. I figured I'd try opening up a public Discord group for anyone who may want to discuss or follow the game. Don't worry. We don't bite. Mostly, anyway. Try to keep it civil. Here, I show off more of the dialog system, and how voice acting works. Cutscenes, Gameplay Tweaks, and Fixes Oh My! It has little to do with the game itself, but the old cover just wasn't doing it for me. The "poorly drawn main character superimposed onto some background art from the game" look, in my opinion, is overplayed, so I made a new one with a bit more originality to it. This one has a strong image of "crap, that otter boy's being menaced by a giant snail. Adventure ensues!" The only thing the old one tells me is "this game has a weasel-faced monstrosity who, at one point, stands in front of a forest." 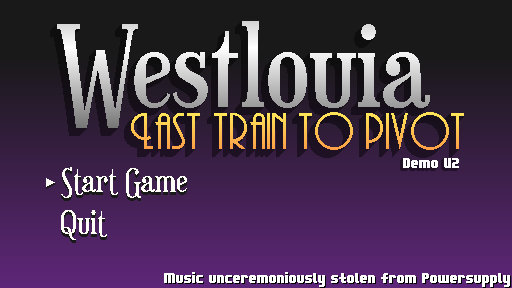 The title screen is largely unchanged, except for the different logo. I wanted to do something special with it, but I couldn't think of anything in time. Oh well. Purple gradients are okay... right? 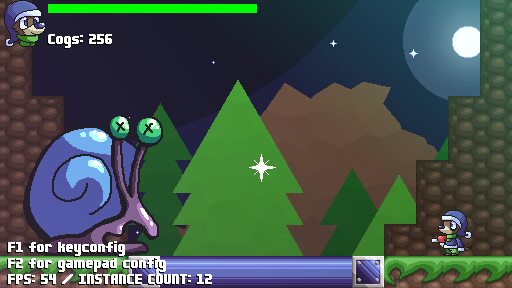 The HUD, however, has had a big revision. 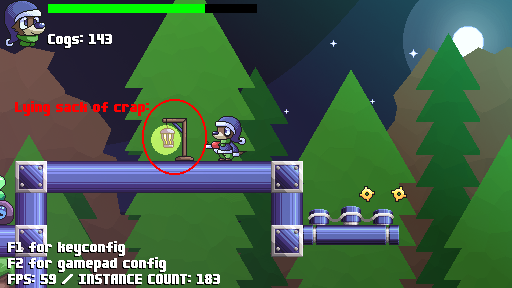 Instead of a standard green health bar next to an off-model drawing of Garret, I have a gear symbol. It meshes well with the cogs you collect, I think. HP is also represented with text under the bar, just so you know exactly how you're doing. 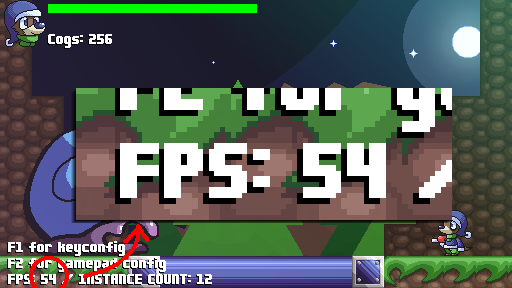 Also, the Instance Count/FPS counters have been moved to the top-right corner of the screen. This is so they don't cover up another HUD element. Speaking of the Instance Count, it most likely won't be in the full game. It's something I use to keep track of how many objects are on the screen. I use it to make sure nothing's making infinite clones of itself in an attempt to take over the world or something. Don't get used to this HUD, by the way. They tend to not stick around. Cutscenes? More like CUTE-SCENES, HAHA. I guess "cutscenes" is kind-of a stretch. They're more like "brief confrontations that just so happen to have textboxes." They add a bit of character to the game, so they're welcome in my eyes. Now you actually have a goal to accomplish beyond just "go right." 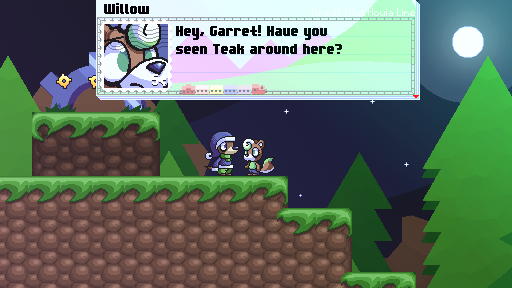 The textboxes are themed after some tacky stationery. The theme of the stationery is "The Great Westlouia Line," a railroad that runs all the way across the country of Westlouia. It's the only sensible way to make it to Garret's hometown of Pivot. This new one makes a lot more sense, at the cost of being somewhat easy. 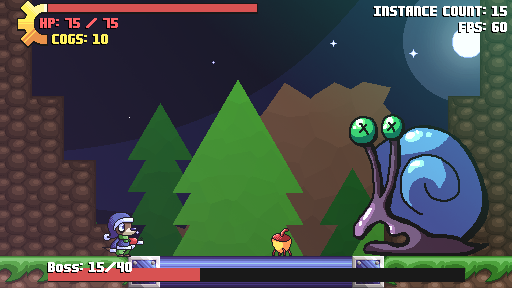 Every attack it does is shared by an enemy you meet earlier in the level, so you already have some idea how to fight it going in. I also stuck a scene before and after the fight, just to give it come context. Overall I think it's much more enjoyable. If you have any complaints, comments, whatever, feel free to tell me about them! There's lots of ways to contact me and keep track of the development of the game listed on the game's page, there. Thanks for reading this lengthy devlog!